Badgers ball as we open up the second half. #Badgers Koenig very demonstrative with Brown just now. THAT'S the start to the second half we were looking for. Bronson Koenig with an early 3-pointer, the 243rd of his career. Badgers take a 30-29 lead. Koenig back on the floor, well-rested and knocking down a three to start the half. #Badgers ' half-court D solid so far. #Gophers lead back up to 3 after the Coffey bucket. Koenig with another three to tie the game. 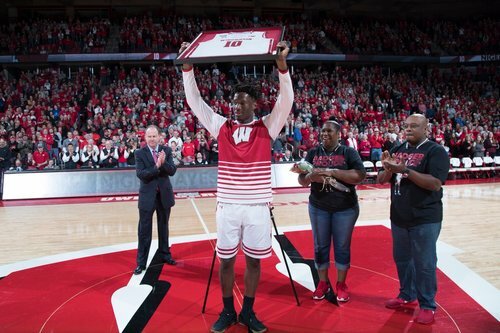 Patiently waiting for the Badgers to post Hayes up. With all the Happ doubles, feel like he could wreck some havoc. Three by Hayes! Badgers up 36-33. 15:00 left. Media timeout at 14:50 - Badgers leading by 3, 36-33. Happ takes it to the basket and draws a foul. He'll shoot free throws after the timeout. #Badgers back in front. UW has scored on only three of its first eight possessions of the second half, but they've all been 3-pointers. UW up 36-33 with 14:50 left. #Badgers were 2-8 from 3 in first half. This half, 3-3. UW has a 36-33 lead with 14:50 left. Koenig with 6 this half. #Badgers Brown active today: 3 points, 4 boards, 1 assist and 1 block. Happ 1-2 from the line but grabs his own rebound. Future strategy??? 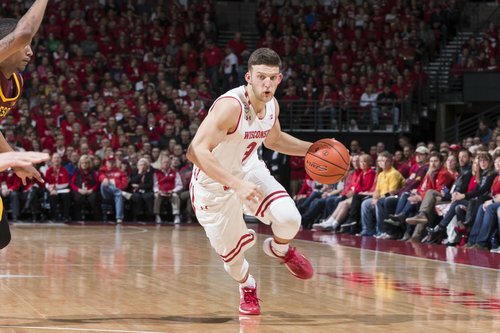 Zak Showalter with a 3-pointer to give Wisconsin a 40-33 lead - its largest of the game - at 13:58. Timeout #Gophers at 13:58 - Wisconsin leading, 40-33. Happ with 10 boards. Closing in on a double-double. Wisconsin on a 10-0 run over the last three minutes. Showy rings one up from downtown and the #Badgers now lead Minnesota by 7! Three from Showalter to extend the lead to 7. MN timeout. Showalter buries a 3 for a 40-33 lead and MINN takes time with 13:58 left. #Badgers 4-5 from 3 this half; MINN 0-4. Amazing how good a team can look when the shots are falling. #Badgers are 4-for-5 from 3 in second half. Have outscored Gofers 13-4. Zak Showalter is into double figures with 10 points to go along with 2 rebounds for the #Badgers . Basket by Mason out of the timeout. Let's check-in with Steve Showalter to see his reaction to Zak's 3-pointer. ???????? #Badgers Iverson and Happ with ugly TOs in the lane. Brutal. Happ really struggling to find the open man off the double. Missed Hayes on the turnover. #Badgers Trice buries a three and is fouled by Murphy. That is his fourth. Meech gets the 3-pointer to go and the foul! He converts the 4-point play at the line. #Badgers up 44-35, 12:15 2H. A four-point play and a layup on consecutive possessions by D'Mitrik Trice gives Wisconsin a 46-35 lead with 11:52 to go in the second half. Where the hell has this been for the last month? D'Mitrik Trice with a personal 5-0 run! Kohl Center on its feet! ???? Timeout #Gophers at 11:31 - Badgers lead 48-35.